“My grandpa passed away in 2003; exactly 14 Years ago this weekend (October 20, 2017). He was and still is my hero and I was very close to him. 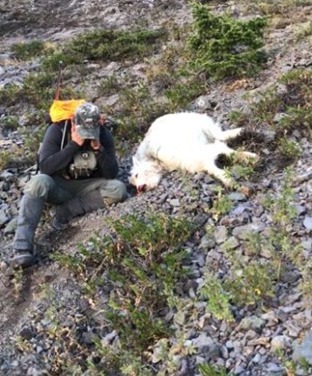 The weekend he died was the opening of hunting season in Montana, a holiday in some respects. Long story short I did not go hunting that weekend. I did however get lucky and draw a once in a lifetime bull elk tag for Wyoming that year. A Modern Day Hunter-Gatherer Joe Kondelis. I am an unconventional dietitian who emphasizes an ancestral way of eating. My conventional dietetics training taught me to meet nutritional needs by following the USDA guidelines for nutrition. In my undergraduate training I was taught to tell clients things like, “there is no such thing as a bad food, only too much of any one food,” and “all food is fine in moderation.” However, in 2010 I took two graduate level courses at Colorado State University from Dr. Loren Cordain, PhD, and the author of The Paleo Diet. Dr. Cordain is an exercise scientist turned ancestral anthropologist. He opened my eyes to a pile of scientific evidence supporting the hypothesis that when we do not eat in accordance with our ancestral genetics the result is chronic disease, dental problems and overall poor health. I no longer believe or teach that all “food” is fine in moderation. Let me explain . . . . Most of what is available at the grocery store as processed, refined, preserved and packaged with almost indefinite shelf life is not “food.” The food science industry, born during the Industrial Revolution did not attempt to improve the nutritional value of food, but to manipulate food to improve its shelf life and assist food marketing industry in selling foodstuff, even to the extent of researching which flavors and textures create an addictive response and keep us coming back for more. Dr. Cordain teaches about eating food from only a couple of sections at the grocery store for optimal health; produce, healthy fats and animal/fish-based proteins. He further states that obtaining food from local farmers, growing at least some of your own food and hunting for wild meat and fish improves health. You can learn more about The Paleo Diet by reading Dr. Cordain’s book or looking up other experts in this field such as Chris Kresser, Mark Sisson or Robb Wolf (and certainly please ask me for help). Based on scientific studies I started using ancestral and whole foods-based eating in my personal life and with people seeking nutrition guidance from me. The effects I saw on improved health for my family, clients and even myself were evident, if not profound. I have not looked back and now advocate for an individualized approach to ancestral eating and lifestyle with great reward. This big shift taught me to be more aware of where my food comes from and to teach these principles to my clients. Ancestral eating is not just about consuming whole foods that are aligned with our genetics. It also includes teaching future generations, camaraderie and working together, helping others, sharing skills and talents for the greater good and working together as a community. This is hard to replicate when stopping by the grocery store for a box of breakfast cereal. I appreciate that my own parents taught me to fish, hunt, grow a garden, preserve food for the winter, cook, process meat we harvested or raised, and share our bounty with others. My parents even sent me to hunter safety class to learn to respect and use firearms. This has been an easy and satisfying way of life for me to return to. In fact, I attended hunter safety training with my own daughters and was a 4-H shooting sports coach when my girls were in their teens. So what does it look like to follow an ancestral way of life in the 21st Century? Some of us do our best to eat local foods, adopt a whole foods eating plan, spend time cooking with family and friends, grow a small garden, and maybe raise a few backyard chickens. Some even provide all the meat for their family as an avid hunter. This is where I would like to spend some time helping you get to know a real, 21st Century Hunter-Gatherer, (and really good human being), Joe Kondelis. 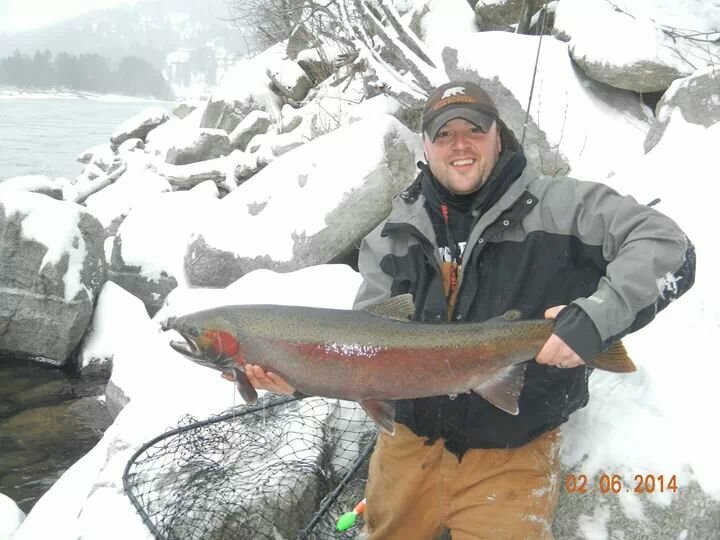 Joe lives in Wyoming with his wife and nine-year old daughter. He grew up in Montana where hunting was a family tradition and way of life to provide food for the family, share in the hunting experience and practice conservation and wildlife management in the Wild West. Joe is also a client of mine. I appreciate that Joe has sought out my help as he works to optimize his health as he ages. I also appreciate that he has been willing to share such beautiful pictures and accounts of his hunting life with us! 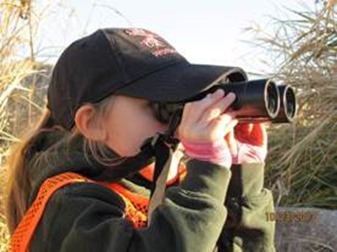 Joe shares the hunting tradition with his daughter. One of her favorite meals is elk steak. Joe appreciates providing food for his family and knowing where his food comes from. “We harvest these animals and always use the meat. We process all our own game so we know exactly what is in it. From field to table we are the only ones that handle our game. I have eaten mountain lion and bear, sheep and elk. You name it we eat it.” Joe fills his freezer with at least one elk every year. His family eats ground meat, steaks and roasts. He hunts a variety of wild game. On the occasion that he has extra meat he has donated to friends, the church and an organization called Montana Hunters Against Hunger. Mountain lion meat prep for chili. 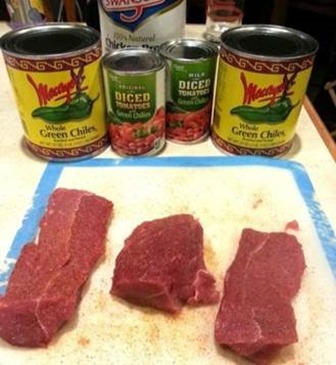 Joe won a chili cook-off with his recipe! Wild game is quite lean. Joe makes a lot of ground meat to use as tacos such as venison tacos or enchiladas. 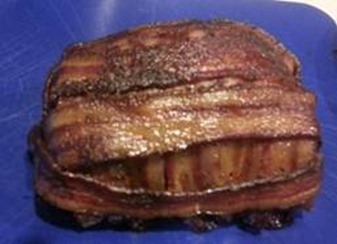 He will bacon wrap backstrap, season it well to then smoke or slow cook. He said meat from adult males is more tough; bucks or bulls are more gamey so he marinates that meat overnight to grill or slow cook. He said cow elk late in year provides really good meat. Another favorite recipe is elk stroganoff with cubed elk meat slow cooked with sour cream and served over cauliflower rice. Check out that bacon wrapped hunk of meat! YUM! Hunting nurtures the spiritual side of life for Joe, another important aspect of health. “I am my true self when I am in the woods. I pray a lot and talk to my grandpa who is my hero. I am grateful to be able to find peace, feed my family and honor the animals that provide us with food,” he said. He also mentioned that hunting helps him manage stress and anxiety. Joe feels that many people do not understand the perspective of a conservationist hunter. Many people look at it as simply taking an animal’s life. He said hunting is important to feed his family and maintain healthy animal populations. He appreciates the North American model for wildlife conservation put in place by Teddy Roosevelt to manage animals with hunting and sustainable harvest to encourage healthy populations. Joe said this model brought some animals back from the edge of extinction by improving animal health through hunting. He also noted that hunting is important to the economy in his home state, Wyoming. Joe has an incredibly giving spirit. He is so passionate about hunting that he founded and presides over the Western Bear Foundation. This foundation aims to encourage responsible bear hunting, bear education and conservation. 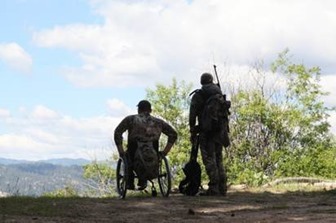 This organization also has a unique outreach program that assists disabled people with access to bear hunting. Joe also has volunteered for the Wyoming Disabled Hunters Association and helps take hunters out into the field. One hunter was Jake Simmons. 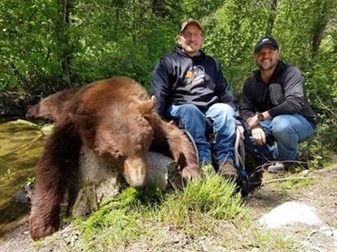 He had a lifelong dream to hunt a bear, but he never thought it would happen due to being in a wheel chair his entire life caused by spina bifida. Joe and Jake Simmons on a bear hunt. Joe and Jake Simmons after a successful bear hunt. Thank you to Joe Kondelis for the insight into the lifestyle and values of hunting in the 21st Century. Thank you for progressive researchers like Dr. Loren Cordain for leading the way in educating others about the hows and whys of ancestral eating. I am fortunate to have sat in class with Dr. Loren Cordain. I appreciate that he opened up my narrow thinking and filled my file drawers with scientific evidence that validates a return to a whole foods and ancestral food plan that may include responsible hunting or at least supporting consuming sustainably and humanely raised food. Awesome Job Tracey. Well written and very informative. Thank you so much for all your help over the last year. I’m so thankful to have your help.